Sword-billed hummingbird with its long bill. 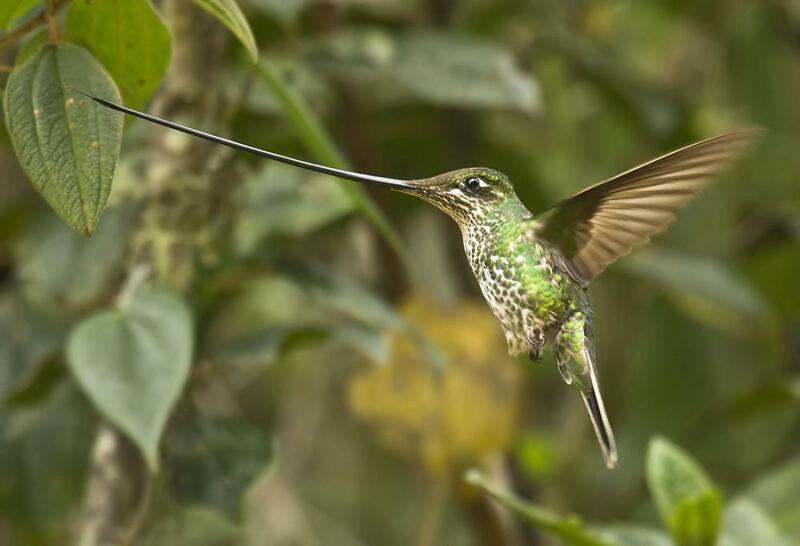 One of the wonderful things about Sword-billed hummingbird (Ensifera ensifera) is the long beak that even longer from its own body. It’s also the biggest in its family with the averages length up to 14 cm (5.5 in) - not including its 8 cm (4 in) bill. While its weighs about 12 grams (0.4 oz). It’s living in high elevation areas mostly from 2,500 m (8,200 ft) in Bolivia, Colombia, Ecuador, Peru and Venezuela. 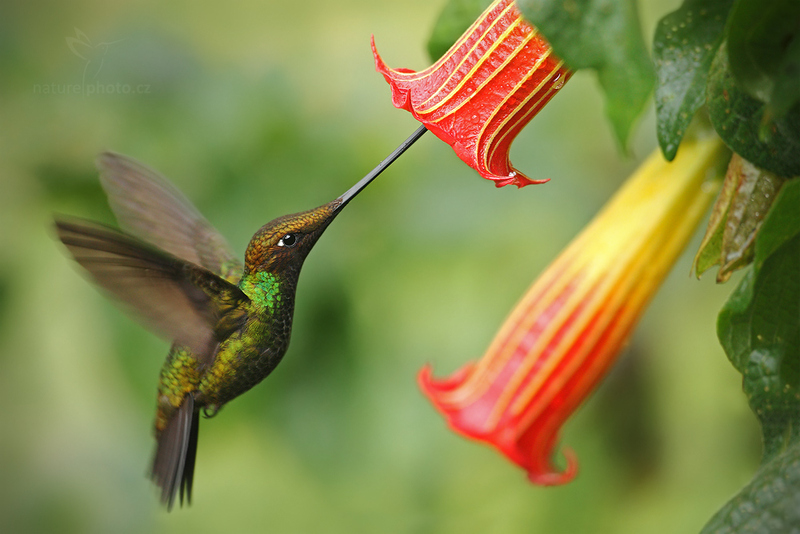 The main purpose of sword-billed hummingbird is to pollinating the flowers with long corollas such as Passiflora mixta and angel's trumpets family (Brugmansia sanguine) where most other pollinators wouldn’t be able to pollinate it. The flower that rely on the hummingbird to be pollinated. 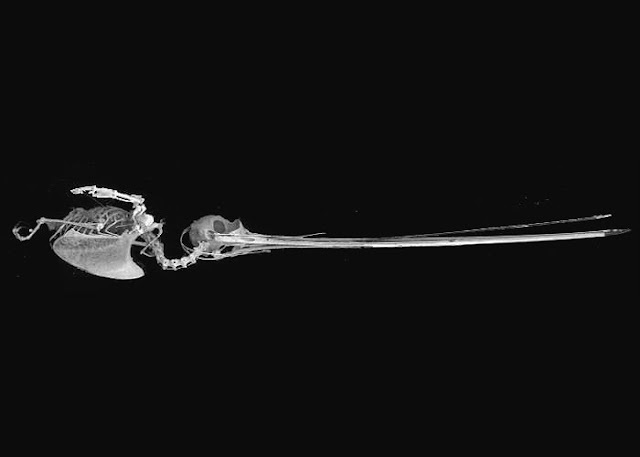 The skeleton of sword-billed hummingbird. Other than flower’s nectar they also feed on small spiders and insects as part of important sources of protein, especially during the breeding season. The insects are important to help proper develop their young. A nesting female can capture up to 2,000 insects a day. The males will establish feeding territories and will aggressively chase away other males as well as other large insects - such as bumblebees and hawk moths that trying to feed in their territory. Another interesting thing about the sword-billed hummingbird is they need to hold its long bill up high in order to balance while perching to avoid toppling over. Hummingbirds are the most amazing and lovely birds of the season and they are mostly found in gardens. Your post is all amazing and full of truthiness.